Northern Ireland’s busiest airport, Belfast International Airport is one of two major air hubs serving the country’s capital, Belfast. Our Belfast International Airport guide has all the necessary information relating to the airport, including contact details, public transport options and recommendations for nearby hotels. The airport information desk (tel: +44 28 9448 4848), located in the arrivals hall, provides information on flights, public transport and general enquiries. A tourist information desk is also located in Arrivals. From central Belfast, travel north on the M2 motorway, then turn off at junction 5 – Belfast International Airport is situated off the A57, 11km (7 miles) from junction 5. The total drive time from Belfast to the airport is approximately 28 minutes. 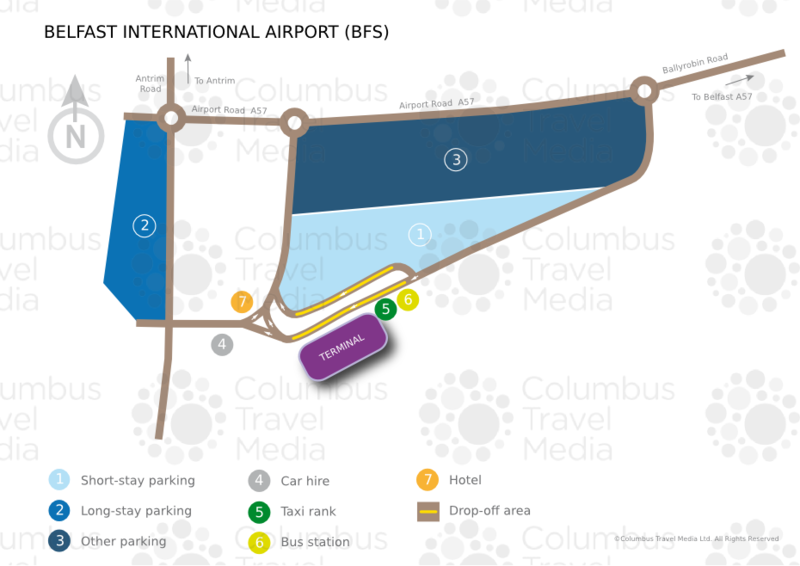 Belfast International Airport is located 30km (18 miles) northwest of Belfast city centre. Bus:The Airport Express 300 (tel: +44 28 9066 6630; www.translink.co.uk) service runs every 10 minutes between Belfast International Airport and Belfast city centre (journey time: 30 minutes; fare: £7.50). The bus departs from the front of the terminal building and travels to Belfast Europa Buscentre, stopping at Templepatrick and Royal Avenue.. Other services are available to Antrim and Lisburn via bus 109A. Coach:A coach service operated by Airporter (tel: +44 28 7126 9996; www.airporter.co.uk) is available to Derry/Londonderry (journey time: 90 minutes; fare: £20). Taxi:Taxis from Belfast Airport Taxis (tel: +44 28 9448 4353; www.belfastairporttaxis.com) leave from outside the terminal building. Fares to the city centre start at £30 and the journey time is generally 25 minutes, depending on traffic. Rail:Trains to and from Belfast, Lisburn and Londonderry call at Antrim station, which is 10km (6 miles) from Belfast International Airport. The hourly Ulsterbus (109A) and taxis link the airport with Antrim. There are two bureaux de change (one in the departures area and one in the baggage reclaim hall) and several ATMs located throughout the terminal building. There are cafés in the check-in and arrivals halls. A range of restaurants, cafés and bars can be found in the main departures lounge, while fast-food outlets are located in the Food Village food court post-security. Shops at Belfast International Airport include newsagents/bookshops, duty-free (for passengers leaving the EU) and a gift shop selling Irish gifts. A ‘collect on return’ service is available at duty free for passengers wishing to pick up their purchases on their return to the airport. Luggage storage facilities (tel: +44 77 8633 3179) are available in the arrivals hall at Belfast International Airport. For lost and found queries, contact the CTS Customer Services team (tel: +44 77 8633 3179). Other facilities at Belfast International Airport include a pharmacy, children's play area, baby changing rooms, travel agency, viewing gallery and a multi-faith quiet room. There is a dedicated outside smoking area located after security, which is accessible for a £1 fee. The Business Lounge offers extensive business facilities, including free Wi-Fi internet access, fax and photocopying facilities, TV, newspapers and magazines, and refreshments. The lounge is available to all passengers travelling through Belfast International Airport. Additionally, ten conference and banqueting suites are available at the nearby Maldron Hotel (tel: +44 28 9445 7000; www.maldronhotelbelfast.com). Free Wi-Fi internet access (for up to 2 hours) is available throughout Belfast International Airport. Postal facilities, telephones and internet kiosks are also available to airport visitors. Wheelchairs are available from individual airlines, as well as from airport staff at check-in – passengers are, however, advised to book a wheelchair in advance from the airline when purchasing their ticket. Lifts, disabled toilets and lowered telephones are available at multiple locations, and porters are on hand to assist with baggage. There is a Minicom unit at the airport information desk where staff are trained in basic sign language. Disabled car parking is offered in the airport car parks. For further details of assistance, contact OCS (tel: +44 28 9448 4957). More than 8,000 parking spaces are available in three parking areas: short-stay, the 'main car park' and the pre-bookable long-stay facility. The short-stay and 'main car park' are located within walking distance of the terminal building, while the long-stay area is linked via a free shuttle bus service. Pre-booked bicycle storage is also available. Car hire companies: Alamo, Budget, Enterprise, Europcar, Hertz and National are represented at Belfast International Airport. Desks for these operators can be found in the arrivals hall.